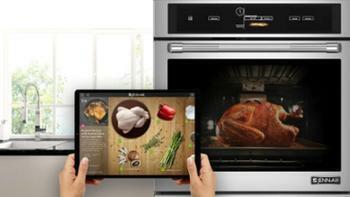 Whirlpool’s new connected ovens may be the non-skilled home cook's recipe for success. The appliance manufacturer recently announced its upcoming line of Jenn-Air wall ovens, which will incorporate software that can sense what you’re cooking and recommend cooking settings. The digitally-enhanced ovens are the result of a collaboration between Whirlpool and Innit software, a Silicon Valley startup founded in 2013. Together, the companies are seeking to bring to market an oven that can help consumers reduce mealtime stress via digital innovation. The ovens -- which can sense the weight, temperature, and type of food inside -- will be able to dish up step-by-step preparation instructions. And whether it’s taste or diet that must be catered to, Innit’s apps can help by offering access recipes tailored to a consumers’ unique preferences. The new software platform "adds powerful and intuitive ways of connecting food to the kitchen," said Brett Dibkey, Vice President of Integrated Business Units at Whirlpool Corporation, in a statement. Wireless connectivity has been a big focus of Whirlpool in recent years. In addition to coming out with app-controlled appliances, the company announced earlier this year its collaboration with Nest on Wi-Fi enabled ranges and ovens. Its Innit-incorporated Jenn-Air brand wall ovens are expected to be available sometime during the first half of 2017.